Clutching a copy of a book by the late U.S. media critic Gore Vidal, WikiLeaks founder Julian Assange was forcibly bundled out of the Ecuadorian Embassy in London and into a waiting British police van on Thursday, setting up a potential court battle over attempts to extradite him to the U.S. to face charges related to the publication of tens of thousands of secret government documents, the Guardian UK and the Associated Press report. During the arrest, Assange resisted officers as they struggled to handcuff him, according to reports from the scene. “This is unlawful, I am not leaving,” he said, as he was led to the police van. He was taken to Westminster Magistrates’ Court and charged with breaching bail, which carries a 12-month sentence. 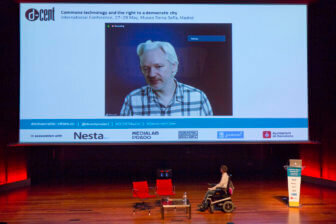 In Washington, the U.S. Justice Department accused Assange with conspiring with Chelsea Manning to break into a classified government computer at the Pentagon. 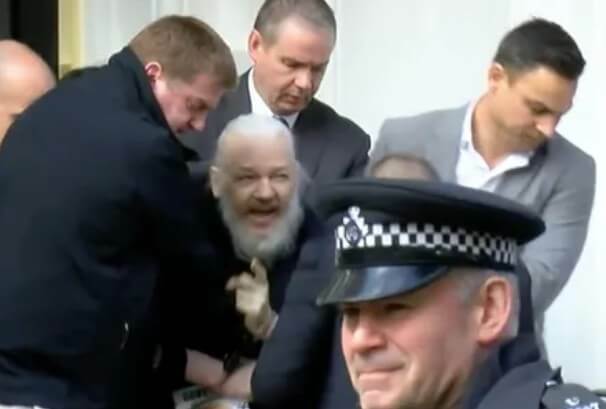 The charge was announced after Assange was taken into custody. His lawyer has previously said that Assange planned to fight any U.S. charges against him. At a newsbriefing later, a spokeswoman for the UK Prime Minister said the government was aware in advance that the Ecuadorians intended to revoke Assange’s asylum status, allowing him to be arrested, according to a tweet from a UK Press Association journalist. A 2017 criminal complaint against Julian Assange details the federal case against the WikiLeaks founder, including chat transcripts accusing him of conspiring with former Army intelligence analyst Chelsea Manning to try to break into the Defense Department computer system.